Howlite is a fairly plain looking gemstone that is used extensively in beading. Though it can be seen in jewelry, its main claim to fame is as an imitation of other gemstones. Turquoise, lapis lazuli and coral for example. Natural howlite can look quite good, particularly when used in bead necklaces. 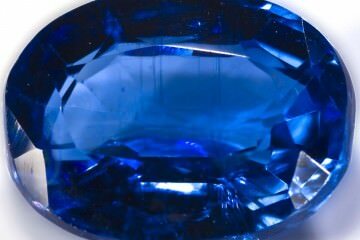 When dyed this gemstone becomes even more remarkable, be careful however that you don’t overpay for it. Howlite is a borate mineral that is also known under the names of white howlite, white turquoise and white buffalo stone. 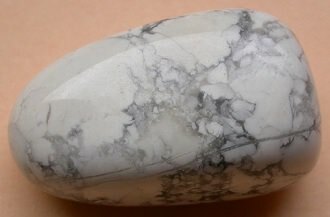 It is almost always white or grey with darker stripes lining the stone. Howlite can occur in crystal form though that is fairly rare and almost all of it is found in a massive form seen towards the right. 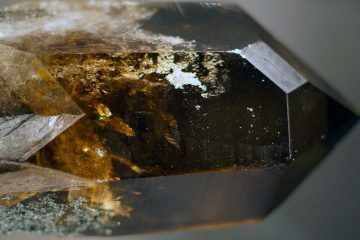 It was only discovered in 1868 by Henry How (after whom it is named) when miners called him to a gypsum quarry in Nova Scotia, Canada where it was considered a nuisance. Howlite has been found in large quantities in California, USA. Sometimes very large specimens of up to 50kg have been found here. 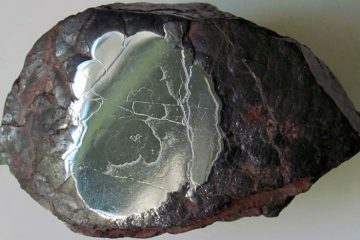 It is a fairly fragile stone and has a hardness of only 3 to 3.5 on Mohs hardness scale. Because the howlite gemstone has a very porous structure it is frequently dyed. This is mostly done to imitate other gemstones such as turquoise and lapis lazuli. In more recent years red coral was added to the list. These imitations can be spotted, but in general they look quite natural. Which unfortunately means that a lot of dyed howlite is sold as if they are the real thing. Sharp temperature changes can weaken howlite, so keep it away from things like ovens or stoves. Its low hardness means that it should always be stored away from other gemstones. Preferably in its own compartment. Not only can almost every faceted gemstone scratch or dent it, every metal commonly used in jewelry can damage it as well. Cleaning should be done with lukewarm water and at most a soft brush or cloth. Make sure you dry it well afterwards and let it air for a few minutes before storing. Do not use an ultrasonic jewelry cleaner because of the high porosity of howlite. A jewelry steam cleaner should not be used either as the heat could easily damage it beyond repair. Physical work is not advised while wearing howlite jewelry. Dropping it or bumping into something can easily scratch the stone. Howlite in its natural white form (under the trade name of white howlite) is mainly used as beads for necklaces. Though pendants or earrings are not unheard of. Howlite rings are quite popular as well. Though I personally would stay away from them, as they are simply far too easy to damage. A large amount of howlite is dyed, either to just enhance the looks or to imitate other gemstones. Trying to imitate another gemstone is fine, however there are a number of people that do not disclose that they are selling you dyed howlite. Frequently selling it for far more than natural howlite will ever sell for. Dyed howlite is sold under several different trade names that are too often used to confuse people. The main culprits are howlite turquoise, turquoise howlite, blue howlite and turquenite. 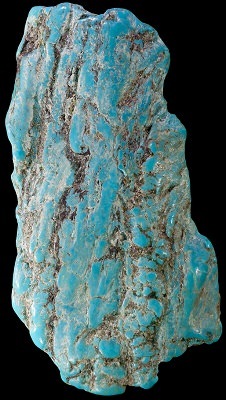 Which are used for a howlite that is dyed to resemble turquoise, seen above. Red howlite is used for howlite that is dyed to resemble red coral. However even natural howlite has trade names that try to link it to turquoise such as white turquoise, (white) buffalo turquoise and white buffalo stone. When in fact howlite is not even distantly related to turquoise. The most important thing to remember is that it is always white, grey or brown, if it is any other color it was dyed. If the dealer claims otherwise I advise taking your business elsewhere. Howlite is quite cheap selling at $2-$3 per carat. Which explains why people are so interested in dyeing and selling this stone as something more expensive. If you are simply looking for the regular stone it makes things easy though, it is not imitated and not enhanced. Though certain dealers do wax their howlite to make it slightly more resistant. Which is a good idea if you intend on wearing it as it is a fairly fragile stone. Howlite can be found in abundance online, Amazon.com for example has close to 1,000 pieces of howlite jewelry. Many of these are dyed though, finding white howlite is a bit more difficult though by no means impossible. It will likely take more effort to find it at your local jeweler and it is probably better to head to a store where they sell crystals and ‘stones of power’. A handmade jewelry store, particularly those that sell beads, is a good option as well. Frequently used in gemstone or crystal therapy, howlite is considered a calming stone. It is mainly used to release anger and relieve stress, though it is claimed that it can assist with insomnia as well. 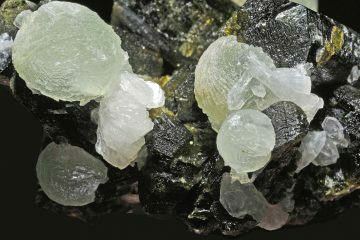 As a calcite mineral it can aid in strengthening your bones as well as teeth, however it should only be used in addition to regular exercise and general health care.